David is on the run. Out of food and without a weapon, he ends up at a town called Nob. David went to the priest, Ahimelech for shelter and food. The priest didn’t have any regular bread on hand. The only bread was holy or consecrated bread. Every day, a freshly baked loaf of bread was presented to the Lord. After it sat there a day and a new loaf was presented, the priest’s families could eat the bread. This bread that was offered to the Lord was called holy bread. David was not a priest, nor was he clean of sin. He had just told a lie to the priest. Saul hadn’t sent David on a secret mission. David was running away from Saul who was again trying to kill him. David lied to protect himself. He didn’t want the priest to come to harm nor be in the middle of the problem. David didn’t need to tell a lie, God would have protected and sustained him. The priest gave David the consecrated bread which had recently been replaced by fresh sweet smelling bread. This is important: in the building was a servant of Saul, Doeg, who was eavesdropping. He watched and overheard what David and the priest were saying. Ahimelech said that the only weapon was the sword that belonged to Goliath. Do you remember Goliath? He was that huge giant of a man that David killed years before. His sword must have been impressive. Maybe David should have had the sword all along. He deserved it for killing Goliath in the first place. Gath was in Philistine country and they were sworn enemies. David heard those words and got frightened. He did something very strange. He acted like he was insane or crazy. He babbled and let his saliva run down his face into his beard. He scratched on the doors. These actions convinced the people he was crazy so they left him alone. David was able to slip safely away. Saul was angry and called for the priest and his whole family. They came and Saul accused them of wrong doing in helping David. The priest reminded Saul that David was well revered, his son-in-law, and one of his mighty warriors. He turned to his guards. “Kill them!” The guards did not want to kill a priest, the servant of the Lord. Sadly, Doeg did as he was told. He killed eighty-five men who were in the priest position. One of them escaped, Abiathar, and fled after David. He told David all that happened. David took responsibility for his own actions. He placed Abiathar in his protection. Saul’s anger toward David had seeped onto two people. 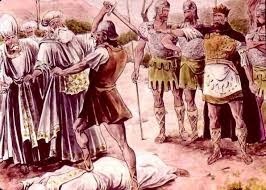 Remember, in the story of David and Jonathan’s friendship, Saul threw a spear at Jonathan because of David. Now we see Saul killing a whole priestly family because of David. Saul’s anger is rooted in jealousy. Jealousy is evil and gets out of hand. Do you think David was talking about Doeg or Saul? Maybe both? Memorize: Psalm 52: 9 I will praise You forever, because You have done it; and in the presence of your saints I will wait on Your name, for it is good. 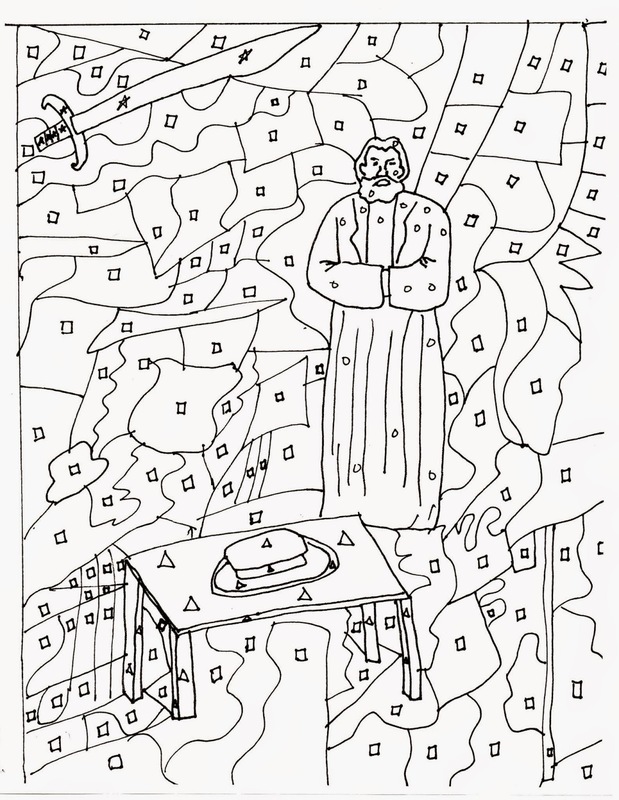 Here is an activity sheet. You will need to print this page and four different colors of markers or crayons. Color all the shapes that have stars one color. Color all the shapes that have circles one color. Color all the shapes that have triangles one color. Color all the shapes that have squares one color. What do you see in the hidden picture?